Varnish and Sludge, the hidden oil pollutants. TRIPLE R filter elements have been engineered to remove all contaminants, solid particles, water and also the oxidation by-products like varnish and sludge. TRIPLE R's level of performance is unequaled by any other manufacturer of oil filtration systems. It's the combination of the special filter media, the 3-stage setup of the filter element and the 114mm thickness of the filter that allows TRIPLE R filter elements to achieve this level of performance. TRIPLE R filter systems are very flexible and can be used in various combinations because all filter elements are interchangeable and can be used in almost every filter series, like BU-, TR-, SE- or OSCA-series. And Triple R filter elements are cheaper than most traditional oil filtration cartridges. A perfect match. For a cost of 45 € ~ 50 €, any TRIPLE R element can eliminate all contaminants from any hydraulic machinery with a tank volume up to 1.000 liters. That definitely makes TRIPLE R the cheapest offering for removing sludge and varnish, solids and water... 3-in-1 oil purification instead of traditional oil filtration. Interested to get a price quote? Send us a message and we will get back to you with an effective solution. What exactly is this sludge and varnish? There are numerous types of insoluble contaminants found in hydraulic and lubricating systems. The two most general classifications of insoluble contaminants are hard contaminants, and soft contaminants. Varnish and sludge are composed of the various oil degradation by-products, the soft pollutants. It is a thin, insoluble film that over time deposits throughout the internal surfaces of a lubrication system. The degradation process accelerates as the lubricant undergoes continued exposure to air, water, catalyst (metal particles) and high temperatures. Sludge contamination is, without a doubt, the least recognized as far as hydraulic equipment contamination is concerned. 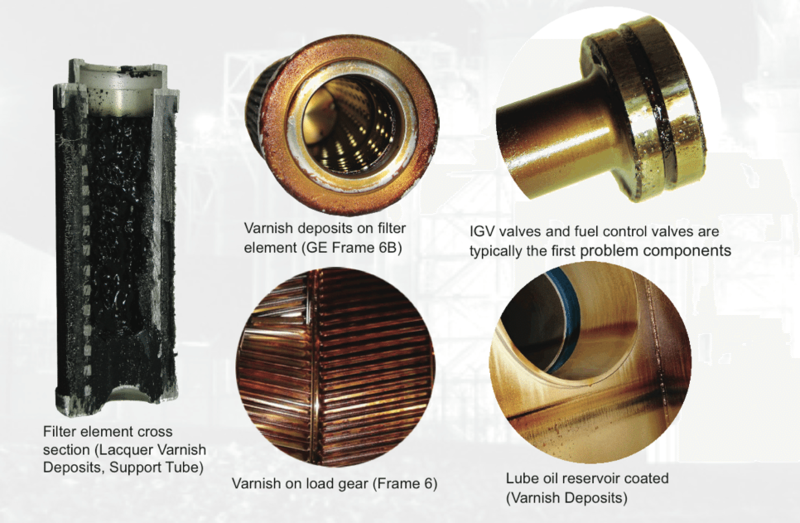 Fact is that varnish & sludge are present in virtually every type of hydraulic and lubricating system . Given the fact that varnish is a soft pollutant, it is not measured during oil analysis. Most operators aren't even aware of their presence in the oil. Varnish captures hard contaminants, creating an abrasive surface that accelerates wear. Heat exchangers become less efficient. Varnish & Sludge deposit adhere to the inside of pipework, thus forming an insulating layer decreasing the cooling effect of heat exchangers. This reduces the efficiency of the heat exchange and results in higher operating temperatures. Again this leads to increased power consumption and to faster oxidation of the oil. The main line filters get blocked. Varnish is sticky, resinous substance, and it therefore stays behind in the pores of filters, quickly blocking them. This may lead to decrease in the flow rate and/or a higher P, and as a result the drive will operate more slowly. It becomes increasingly difficult for the pump to circulate the oil, leading to cavitation, higher power consumption and increased wear and tear. The main line filters need to be replaced more frequently. Valves clog or operate badly. The presence of sticky resins increases friction to 5-6 times higher than nominal value. This will result in higher energy requirements and can cause stuck or seized valves. Reduced clearance zones affecting lubrication. Often, this means a transition from full film to boundary lubrication, resulting in increased wear in pumps, bearings, gears and valves. System corrosion and accelerated degradation due to acidic constituents. Varnish compounds are typically acidic and corrode metal surfaces. Resources and costs required to clean varnished systems.